First of all I would like to thank Jenilee for taking over Wednesday's Walk. I have missed walking down Memory Lane with my blog friends as we share our memories together. I look forward to the weeks ahead as we get back into it. Memories Of My White Steepled Church From My Childhood! I now attend a large church just around the corner and up the street from our house, and it is less than a mile away. It has a large white steeple on it's very tall roof and my husband can see it from the golf course and it is seen from quite a distance. It holds about 750 or 800 people. But when I grew up in Southern California I went to a tiny church called "Silver Acres Community Church" and it held about 75 people I suppose...maybe even less than that. It had a bell tower and a tall white steeple. One year I had a Sunday School class up in that bell tower room and we girls got to take turns pulling the rope and ringing the bell when church was about to start. Yes, it was a big old fashioned bell just like you see on Little House On The Prairie, or the church on Dr. Quinn. And that bell was really loud in that little room when we would ring it. But we all loved taking our turns ringing it. And people in the neighborhood would surely know it was time to get to church when they heard it ringing. The church was called "Silver Acres" because the street it was on was Silver Drive. It was just a few miles away from our house, but when I was a girl, it seemed like it was far away. I went to that church from when I was a small child until I got married, and I have so many happy memories of it. When I was little we loved summertime and part of that was because we would have Vacation Bible School at our little church. My brother and I would invite our neighborhood and school friends, and several of them attended with us over the years. We would first meet in the sanctuary each morning and have opening prayer and songs and then we would go to our separate classrooms according to our ages. My mom would be a teacher or a helper every year, but never in our classes. (She needed a break from us) Ha! Or she would sometimes work in the nursery. And with each color we sang about we would turn our pages to that color. I also loved the times when our pastor, Reverend John Utterback, would do fun little exercises each day with us, like the day he held up a dollar bill and let the kids hold up a finger and a thumb and try to catch the dollar as he released it. (Not too many would ever be fast enough to catch it, but all of us kids thought we would be the ones that could do it...and I'm not sure what that little lesson taught us...but as I said, it was fun). He also blindfolded some of us and told us to sit down in a chair he had placed by the pulpit...it was a lesson on faith and trust. That is also where I learned the books of the Bible which have benefited me my entire life when it comes to looking up scripture. But back then it was a fun challenge to see if we could say all 66 books in order...and in one big breath! I could do that...and I was pretty proud of myself...(In a humble way of course)! One year we had a Chalk Artist come and he told us stories each day as he drew a lovely picture with chalk, and when he was finished he would turn on the black light and a hidden image would appear. It was a picture of Jesus on the cross and then the black light would show him ascending up to heaven...or something awesome like that. I still love chalk drawings to this day, and we have a lovely lady at our church here in town who travels around and does those for different groups of people. She plays Christian music while she draws. Have you ever seen a chalk artist? When I was a teen, my mom and I used to sing in our choir at our little church..and there were maybe 10 to 15 people in the choir. One Easter I had a solo in our youth choir and I was so nervous...but God gave me grace and I somehow got through it. I was extremely shy back then...and I still am when it comes to doing anything in front of a group of people. I still prefer relating to people one on one. Hosanna, Hosanna, Hosanna... in the Highest! Blessed is the King of Israel~ that cometh in the name of the Lord!!!!!! As we teens sang each song they showed a film with the birth, life and crucifixion...and then the resurrection, and it was a very moving presentation. Every Easter I remember that time and think back to those days. Isn't Easter a wonderful time when you are Christians? I also remember Christmas plays as a child and other fun times with our little church family. Oh, and there was that time when we forgot to change our clocks when the time changed and we showed up to church an hour early! Ha! Our pastor who lived next door to the church, came out laughing and said "did you forget to change your clocks? "...then he invited us into his house for donuts! Oh how I loved that pastor! I am sure he is in heaven now since I haven't seen him for over 30 years and he was older when I was a child. I will love seeing him again when I go to heaven someday. When I think of him I think of the song..."Thank You for giving to the Lord..I am a life that was changed..."
It was my mom and Pastor Utterback that taught me so much about the Lord when I was growing up. My Mom is up there too, and it goes without saying that I long to see her again, in heaven where we will spend eternity with Jesus. Did you go to a little white steepled church when you grew up? Do you have memories like I am sharing today? I would love to hear about them. Isn't it wonderful to love the Lord and to be able to share Him with others no matter where we are? This is a sweet post and I enjoyed reading your memories. The church I went to as a child holds a special place in my heart. I attended this church from age 3 til 18. I remember falling in love with Jesus as a 3 year old! 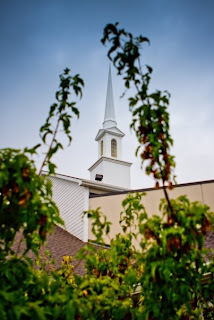 There would be church, Sunday school, youth group, singing in the choir, lighting candles, babysitting, pulling taffy, scavenger hunts, vacation Bible school, attending my sister's wedding there, a few funerals, studying church history...moving away and returning as a married Lady with children, attending Ladies Group, giving dinners, I truly have blessed memories from this church. Thank you for sharing this post. You have brightened my day! Wow. You have a great memory! And what sweet ones they are! I remember going to my grandparents' church as a child. Every summer I stayed with them and they took us kids to VBS. I memorized the books of the Bible too and recited them in front of the whole church. It was a little church on Long Island. To this day it helps me to find any books in the Bible. Thanks for stopping by and visiting on Heart Choices. I also enjoy your granddaughter's blog too. I think churches like that are so precious! I always wanted to get married in one but it didn't work out that way. we got married on a camp ground! which was fun in itself. :) thanks for working so hard to share this memory with us!!! One day, we will all be in Heaven together......won't that be the most amazing thing! I would feel like it was Heaven on earth if I had you all in the same town as me now.....can you imagine how awesome that's going to be when we really are all in Heaven together forever?!! I loved your story of your church! What precious memories you have! I experienced a chalk drawing once in Wichita. My parents took me to Bill Gothard's Institute for Basic Youth conference and he did one there. It was really cool. I have memories of church but mainly from when I was younger and we lived in Washington. I remember the crafts and the Bible stories. But mostly I remember a woman named Peggy that prayed for me regularly! She would send me a card very often and for birthdays. I even have a doll she gave me. Such a precious woman, I didn't realize what a blessing she was back then till later. Thanks for your memories you have shared. those early church memories are totally unforgettable and irreplaceable. Thanks for sharing! Fabulous memories, Linda! I love that you loved so much about your church growing up!! I feel like I was right there with you! I loved reading this! My church doesn't have a white steeple but I have gone to the same smally country church since I was a child (except for a few years away at college). The church isn't that small anymore, but it was about the size of yours when I was growing up. We don't call it a small country church anymore either. We call it a "world missions strategy center" - pretty cool, right? Your post was very dear to me. I grew up in VBS too and am now the VBS director at my church. Although the church has grown and changed much and God has richly blessed us there, the friendships and relationships I have made there (especially the ones when I was young) are so very special to me! Those small churches are just a great family of friends, aren't they? I loved reading your post!! Thanks for sharing! Hi! This is my first time here and I especially loved reading about all you learned as a child and how you remember it! My hubby and I work in Kids and youth ministry, so I was so encouraged! Thanks! Linda- This was such a great post to read! I am glad that Jenilee is taking on Wednesdays Walk too! The White Church Steeple is always a favorite thing for me to see as we travel with opur family. Usually we can see one on every town as we travel on the highways. We have had Chalk Artists come here to our Church and we love the amazing ability to portray a message- and in such a beautiful way! Your family is a joy to read about- what a heritage! I love the Zoo pics that Lynnette posted, and think your time with family looks wayyy to much fun! I loved reading your memories of your little, white steepled church! How beautiful...your pastor sounds like a wonderful, Godly man...and your sweet mom gave you such a wonderful gift passing on her faith to you. What special memories of a place where you learned of the Lord with people who love Him! Hope you are well...I miss visiting with you! Your blog is a blessing- Thank you for writing. I looked up your church in So Cal - & meant to go over there & take some pics for you, but i've not done it yet. However, if you go to Google maps you can see your church from street view. I've sorta seen those types of chalk drawings and they are really neat!!! It is so neat to walk down memory lane. I might have to participate next week. I will never forget the stained glass windows in the sanctuary from my childhood church. Thank you for sharing with us today. I also have sweet memories of some churches I attended growing up. In our towns biggest church, which wasn't that big, there was a button to push to ring the steeple bell.